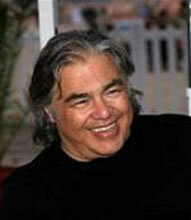 Aaron Russo, a famous patriot and successful Hollywood and business figure died last week. In his famous film, “America: Freedom to Fascism” he spoke out against the police state in America and the reducing of our rights and liberties. Interestingly enough, he also promoted Ron Paul. In fact, he was one of the first to support Ron Paul’s bid for White House appointment. At the end of Aaron’s movie he made it quite clear, “Stop being good Democrats, stop being good Republicans, and start being good Americans”. The message is simple, but can you transcend the parties and vote for a man based on his message alone? The two party system is merely an illusion set up to divide us. And Ron Paul’s message is clearly not a message passed down from party headquarters, his message is passed up from “We The People”. This entry was posted on 08/28/2007 at 23:30 and is filed under Elections 2008. You can follow any responses to this entry through the RSS 2.0 feed. You can leave a response, or trackback from your own site.